IN A further move into banking, Tesco has taken a 20-year lease on a seven-story building in Glasgow to house a customer service centre. It comes 12 weeks after Tesco Personal Finance opened its HQ in Edinburgh. It Glasgow, recruiting will begin later this year for 800 people full time plus 200 part-timer and the first are expected to be in place early next year. In addition, the company is in talks with Royal Bank of Scotland to transfer 500 of the bank’s Glasgow-based employees, who handle its banking account holders, to the new building. Tesco Personal Finance began in 1997 as a joint venture between Tesco and RBS and in December Tesco bought out RBS for £950m. The Glasgow building, called Broadway One, is on the corner of Renfield Street and Renfrew Street. It was developed from the former STV studios and has 125,466 sq ft of office space with 19,000 sq ft floorplates. It includes a basement car park, double-height entrance foyer, four high-speed passenger lifts and male and female showers on each floor. It was completed at a cost of £45m by Laing O’Rourke (Scotland) and is jointly owned by IVG Development, headquartered in Germany, and Ediston Properties. The second phase of the development, next door, is Broadway Two, which will offer 148,000 sq ft.
Tesco Personal Finance (TPF) claims 6m customers for its 28 different financial products and services, including credit cards, loans, savings accounts and motor, home pet and travel insurance. It also owns the comparison site Tesco Compare, a network of ATMs and, by the end of the year, plans to increase it number of in-store bank branches to 30. 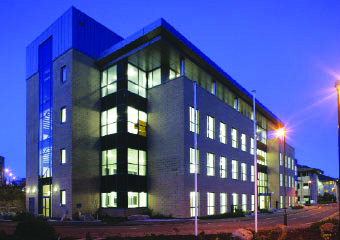 TPF, which received a £5m grant from the Scottish Government for the Glasgow project, expects to migrate all of its existing customers to the new building by the end of 2011. The chief executive of Tesco Retailing Services, Andrew Higginson, said: “The opening of the new customer service centre will be a significant step towards TPF offering a full banking service. In June, TPF’s new HQ at Haymarket, Edinburgh, was officially opened by the Scottish First Minister, Alex Salmond, along with Tesco’s chief executive, Terry Leahy. About 250 staff moved there from the RBS HQ six miles to the west of the city — which Tesco says will save more than 37,500 car journeys each year — and another 200 are planned to be recruited within 12 months. TPF has taken a 15-year lease at £25 per sq ft.